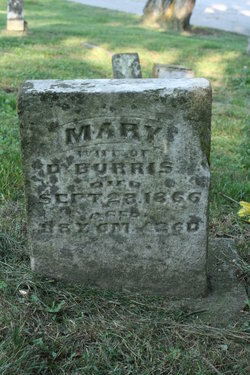 She married Daniel Burris on Nov. 27 1794 in Surry Co., NC. In 1806 they left NC for OH. About 1830 they moved to IN. Mary & Daniel were members of the Fall Creek Monthly Meeting in Rainsboro, OH, Religious Society of Friends (Quakers). As did many Quakers, they assisted slaves northward on the underground railroad. Mary & Daniel’s 16 known children were Rachel, Stephen, John H., Jacob, Martha, Mary, Daniel, Bowater, Abraham, Moses, Horton, Miles, Andrew “Andy”, Lewis, Elias Henry & Rebecca.